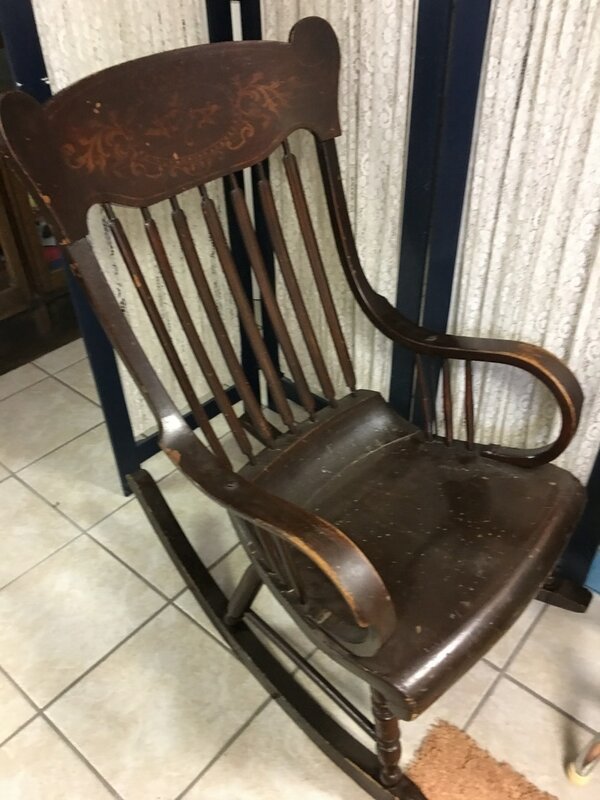 The Historical Society was recently presented with a rocking chair by Francine Colling and not because she thought anyone would take time to sit with all the items out for viewing in our building. The chair probably dates back to the turn of the century. 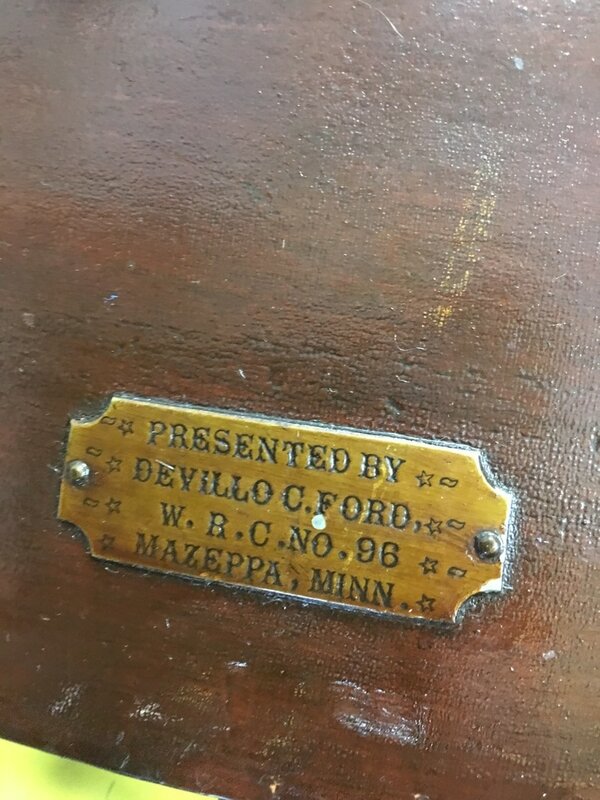 On the back is a brass plaque which reads “Presented By Devillo C. Ford W.R.C. No. 96 Mazeppa Minn”. On the bottom of the chair is stamped with the words “State of Minn.” along with a number. Reading recently of the State looking for some of the original furniture from the Capitol Building, it was thought that this could be from that collection, as our Capitol’s construction was completed in 1905. Contacting the Mn. 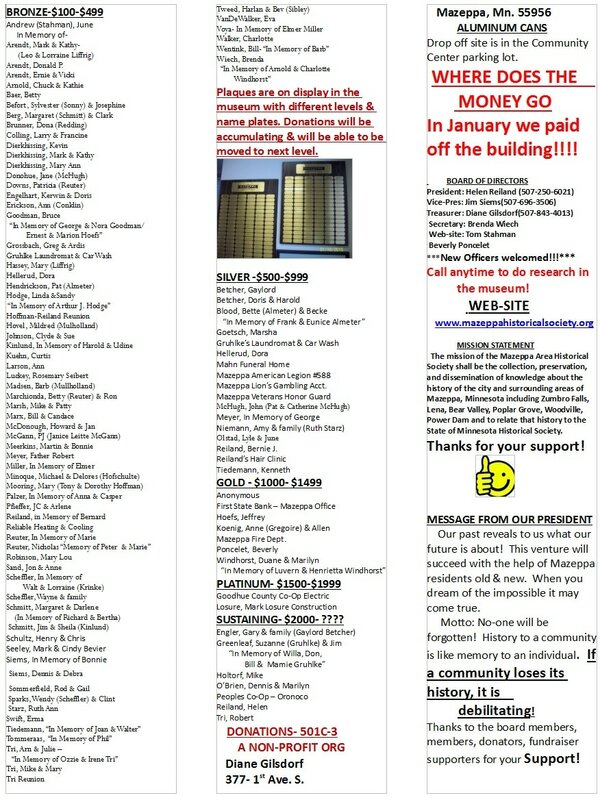 Historical Society for their help in some research, their findings lean toward a chair from the Minn. Soldiers Home. Hence, the letters “MSH” also embossed on the bottom. It was probably bought with funds donated by the Womens Relief Corp, the auxiliary branch of the Mazeppa Grand Army of the Republic, Devillo Ford Post 150. 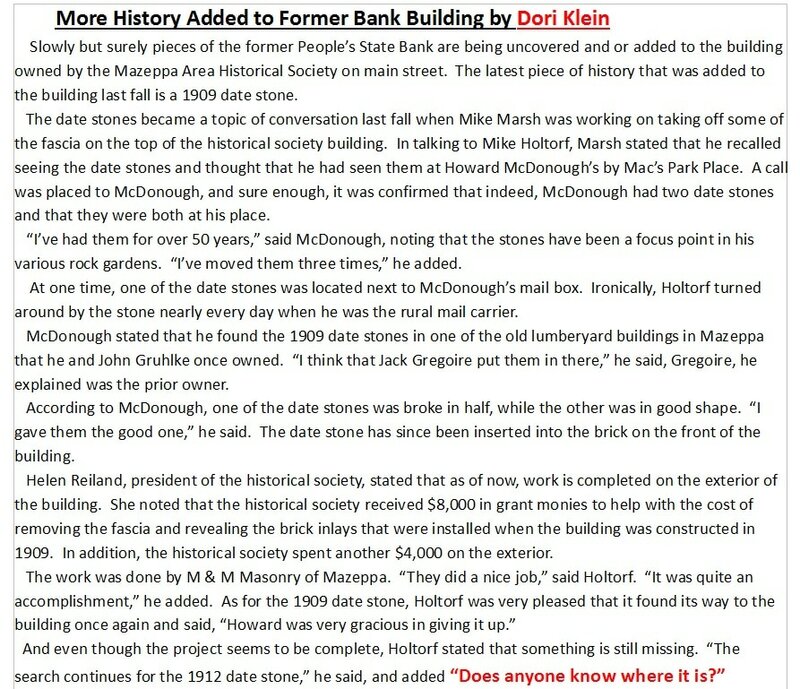 The local post was organized in the 1870s and named in honor of the son of Joseph Ford, founder of Mazeppa. Soldier Devillo passed away at Murfreesboro Tenn. The National organization was disbanded in 1956 as most of the Civil War Veterans having passed away. Imagine the number on honored veterans who have sat in the chair in their closing years at the Home. The chair is a very nice piece of history that has made its way back to its beginnings in Mazeppa. Francine thinks she bought it at an auction in Red Wing some years ago. Thank You Francine! APRIL 22ND –COMMUNITY CENTER @ 2pm.